Seco Tools’ UK headquarters and factory (www.secotools.com/gb), based in new, purpose-built premises in Alcester, is the Swedish group’s worldwide centre of excellence for producing custom versions of its high-pressure Jetstream tooling. It is also the only facility in the UK operated by a major tooling supplier that designs and manufactures custom tools for non-standard turning and prismatic machining applications. Two Hermle C 30 Us were supplied by sales agent Kingsbury in the mid to late 2000s, both fitted with a 157-tool carousel and a 12-station Erowa pallet pool for overnight unmanned production. The flexibility of the automated cells allows 1- to 20-off batches of bespoke tools to be produced economically. 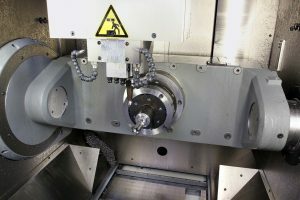 To cope with increased demand, Seco needed a third, similar machine so that it could swap work seamlessly between three 5-axis production centres. Another 5-axis C 30 U was installed but this time, for added flexibility, it was equipped with a manual Erowa system to help the operator load and unload pallets, rather than having a pallet pool for automatic exchange. It has proved ideal for supplementing the fully automated cells and additionally helps produce larger quantities of standard tooling products, such as thread milling cutters, for world markets. Options on all the Hermle machines, including the latest model, are 4-arc-second accuracy for movement of the rotary table and the +30 / -115 degree trunnion, tool length measuring with offsets sent automatically to the Siemens control, tool breakage detection and high-pressure coolant. High productivity is promoted by the 18,000 rpm spindle and 45 m/min linear rapid traverse rates. All of these machine attributes have helped Seco to cement its position as a leading tooling manufacturer in the UK. A spokesperson for Seco Tools (UK).